The modern ice axe is the end product of a long history of tools being adapted, redesigned and specialized. Its first incarnation was actually as two different tools: the hand axe and the alpenstock. Over the years, these two implements were melded to create the ice axe of the late 19th and early to mid 20th centuries. While ice axes of that type are still in use and production today, offshoots of that tool have evolved back into two separate pieces of equipment again: the ice tool and the trekking pole. The oldest ancestor of the ice axe is the alpenstock - an implement originally used by shepherds and hunters in the Alps and the Caucasus as a tool to keep its bearer stable when walking on ice and snow. Invented sometime in the middle ages, the alpenstock was created to do the work of crampons. The earliest alpenstocks were long wooden poles of about six to ten feet in length, tipped on one end with an iron spike. They were used by planting the iron spike firmly in the ice and using the wooden staff to help pull oneself forward and stay upright on slippery ground. This alpenstock is of the oldest variety. It stands about five and a half feet tall and has a sharp metal spike at the bottom. Mountaineers would carve the names of their alpine conquests into their alpenstocks. Jacques Balmat with an original alpenstock. He has an ice axe at his belt for cutting steps into the snow. An 1870’s photo of men using original alpenstocks to cross a crevasse in the Alps. These alpenstocks have no cutting tools. A woman of the late 1800’s holding her alpenstock. This variety also has no cutting tool attached. A party of mountaineers crossing a glacier in the 1870’s or 1880’s. The leader of the party used a hand axe to cut steps into the snow - the rest of the party used alpenstocks for balance. Beginning with some of the earliest ascents of the Alps by mountaineers, the alpenstock was often used in conjunction with a small hatchet. The alpenstock kept one upright and the axe was used to cut steps in steep icy slopes. As the sport of mountaineering gained popularity, and the new business of mountain guiding grew, it was most common for only the guide to carry an axe, since they would be cutting the steps. The rest of the party needed only alpenstocks. In the 1800's these two tools were merged by affixing a pick (the sharp part) and adze (the flat piece) on one end of a wooden shaft and a spike on the other. In these early versions, the pick and adze are about the same length. Later, the shaft itself was shortened to a little under five feet on average, making it possible to both stabilize oneself on icy ground and cut steps for one's climbing party with the same instrument. They could also be used for stabilization by anchoring the cutting edge in the snow while the climber held on to the shaft, or to arrest a fall. Made of oak, hickory or ash and including parts made of iron or steel, the alpenstocks of the late 1800's were heavy and cumbersome. When crampons started to be of higher quality and more reliable, the length of the alpenstock was shortened further, reducing the weight to about three lbs and creating a tool that was starting to resemble the modern ice axe. The pick side of the head lengthened until it was longer than the adze. Andrew James Gilmour and his ice axe, photographed in the 1910’s. From the Andrew James Gilmour collection. A mountaineer resting his hands on his ice axe while on the trail. Andrew James Gilmour posing with an ice axe on a summit. A climber ascending a rock face, using his ice axe as a walking stick. 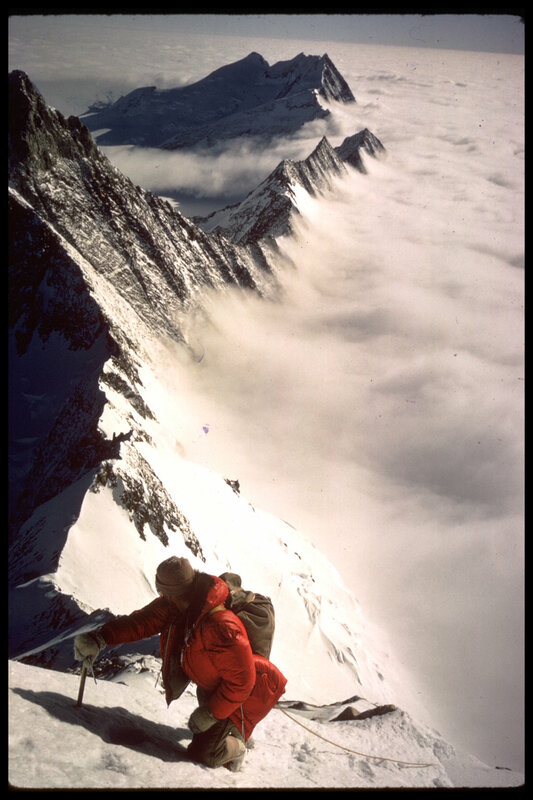 From the collections of the American Alpine Club. These ice axes retained much of their resemblance to their longer cousins, they usually came to about waist height, or a bit shorter. These could be used in much the same manner as the longer versions of the late 1800's, and also the same as a cane or walking stick; to provide stability while on uncertain terrain or while wearing crampons. Fanny Bullock Workman's (1859-1925) ice axe - Workman was a prominent female mountaineer and a founding member of the American Alpine Club. Ice axes (as they were almost universally being called by that time), became shorter still. Most were about two feet in length and made of a strong wood. The pick had become very long and the adze continued to shrink. Below are some great examples of mid-20th century ice axes in use on the 1966 American Antarctic Expedition. These photos are from our Nick Clinch collection. As mountaineers and climbers pushed themselves and the sport into ever more challenging frontiers, they needed an ice axe made of materials stronger than wood. In the early 1960's Hamish MacInnes and Benjamin and Steven Massey started production of the first ice axes made entirely of metal called the MacInnes Massey ice axe. These ice axes were infinitely more durable than the wooden axes that came before, and were less prone to snap under pressure or if stored at incorrect temperature or humidity. According to the Scottish Mountain Heritage Collection, MacInnes created the all-metal ice axe after being involved in the recovery of the bodies of a climbing group who fell to their deaths when the wooden shafts of their ice axes snapped. The advent of the more sharply angled pick, as opposed to the an axe head which was entirely perpendicular to the shaft, came about in the early 70s. Early manufacturers include MacInnes-Peck with the Terrordactyl axe and Yvon Chouinard. These axes had shorter shafts which made them very useful for steep slopes. The curved blades made ascents of increasingly vertical ice possible and it wasn't long before climbers were pulling themselves up frozen waterfalls. A new head design of the axe uses pressing techniques, which allow a light metal steel (as used on spacecraft) to be used. The pick is dropped at an angle of 78 degrees which has been found to be the optimum angle for cutting and holding and the adze is made from the same material giving a uniform thickness throughout. Through the 1980's ice axes became more specialized and diverse. The term 'ice tool' came to refer to axes more specialized to steep ice climbing, with curved and reverse curve picks, adze end variations such as hammers, and modular functionality. These tools are typically what we mean today when we speak of the ice axe. As is evident from the design, these implements have lost nearly all functionality for traction or stabilization when walking on difficult terrain. They are specialized for ice climbing. A modern ice tool for climbing frozen water. George Harr's home made ice axe. William Sargent Ladd’s ice axe. Ladd was president of the American Alpine Club from 1929 - 1931. From the collection of Richard K. Irvin. These ice axe heads are the remains of three charred ice axes - they belonged to Howard Palmer. Schneider, Steven. High Technology. Contemporary Books, 1980. Get it here! Lovelock, James. Climbing. Batsford, 1971. Get it here! Raeburn, Harold. Mountaineering Art. T. Fisher Unwin, 1920. Get it here! Wilson, Claude. Mountaineering. George Bell & Sons, 1893. Get it here!